I’ve become quite infatuated with sandwich cookies in many forms, and whoopie pies are one of my favorite varieties. The cookies are puffy and cake-like, and just adorable when sandwiched with a yummy filling. Recently my friend Sarah asked for help making chocolate marshmallow whoopie pies and I jumped at the chance. Even though I have tried pumpkin whoopie pies and red velvet whoopie pies, I had yet to try the chocolate-marshmallow combo, which to my understanding is the “classic” whoopie pie flavor. So we made them, and we loved them. The cookie was rich and chocolatey and the marshmallow filling was just right – good marshmallow flavor but not too sticky. As is often the case, I actually thought these tasted even better the second day after the flavors had time to meld. 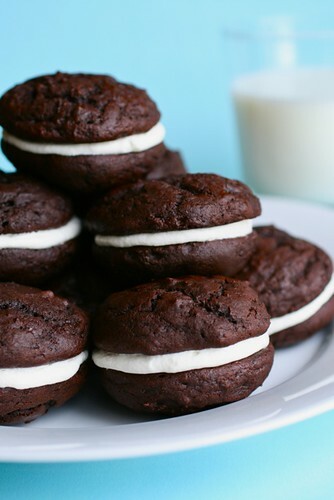 If you’ve ever had a classic whoopie pie or even if you’ve never tried one, I bet you’ll like these. Preheat the oven to 400˚ F. Combine the flour, salt, cocoa powder, baking soda, and baking powder in a medium bowl; whisk together to blend. Set aside. Line two baking sheets with silicone baking mats or parchment paper. In the bowl of an electric mixer fitted with the paddle attachment, combine the butter and sugar. Beat together on medium-high speed until light and fluffy, 2-3 minutes. Beat in the eggs one at a time, blending well after each addition. Blend in the buttermilk and vanilla extract until incorporated. Mix in the dry ingredients, blending just until combined. Using a 1-oz dough scoop, drop the batter onto the prepared baking pans, 12 cookies per pan. Bake for 12 minutes, rotating the pans halfway through baking. Allow to cool on the pan 5-10 minutes, then transfer to a wire rack to cool completely. Repeat with the remaining batter. To make the filling, place the butter in the bowl of a mixer fitted with the paddle attachment. Beat on medium-high speed until smooth, 1-2 minutes. Blend in the confectioners’ sugar until incorporated. Beat in the marshmallow fluff and vanilla until light and fluffy, 2-3 minutes. Once the cookies are completely cooled, match them up in pairs by size. Fill a pastry bag fitted with a plain with the marshmallow filling. Pipe a dollop of marshmallow filling onto the flat side of one cookie of each pair, and sandwich the cookies together, pushing the filling to the edges. Store in an airtight container.